We've put together the finest overall woman-specific formula available. Primary considerations for this combination included: new research, mineral balance, female needs, tablet disintegration and size, and optimal Y2K potencies for superior nutrition. Disintegration time less than 30 minutes. Moderate potencies of B vitamins, with extract strength B-3, B-5 and B-6. Other Ingredients: Cellulose, Silica, Stearic Acid (vegetable source), Croscarmellose Sodium and Vegetarian Coating. Vitamin E from non-GMO soy. U.S. Patent 7,838,042 and patents pending, and the trademark TRAACS® are used under license from Albion Laboratories, Inc.; Ferrochel® is a registered trademark of Albion Laboratories, Inc.; Aquamin® is a registered trademark of Marigot Limited. Buffered form of Vitamin C, calcium ascorbate, for reduced acidity. 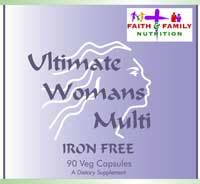 Contains Albion`s patented Ferrachel iron bisglycinate which is gentle on the stomach. Herbal extracts traditionally used by women include: dong quai, Siberian ginseng and standardized chasteberry extract, 50 mg of standardized wild yam extract. Important: potent levels of soy isoflavones, and ipriflavone for optimal female health. Other Ingredients: Cellulose, magnesium stearate (vegetable soured) and silica. Contains no yeast, soy, milk, corn or preservatives.